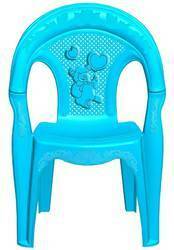 Prominent & Leading Exporter from Mumbai, we offer baby chair. Our experience and complete knowledge enable us to supply, export, trade and import Baby Chair. These chairs are manufactured at vendors' premises using best-in-class plastic and basic materials that are checked twice to ensure flawlessness. Knitting a vast distribution network, we have been able to dispatch these chairs to the clients' end in committed time-period. Besides, the Baby Chair offered by us can be customized on the basis of specifications. Looking for Baby Chair ?